My Husband and I wanted to put up some kind of Christmas decorations in our apartment windows over looking the city. 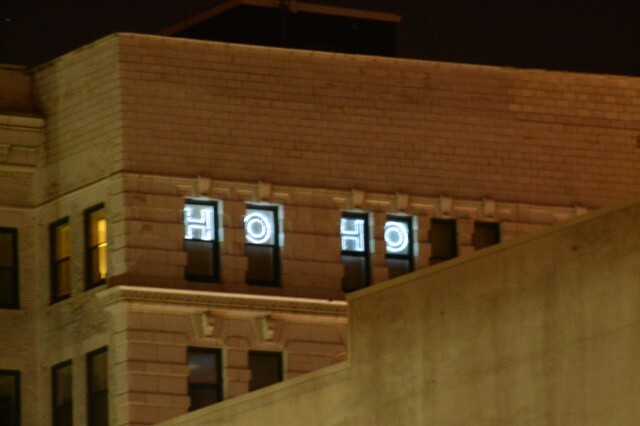 After talking about it for a while, I decided to make lighted letters saying, “HO HO HO” …but since we only have two pairs of windows, it would have to just be, “HO HO”. 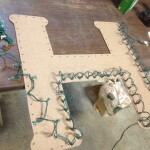 …it was time to drill the 400 holes and hot glue all the lights in place. It only took a weekend to make and hang these and I think the end result is well worth it. 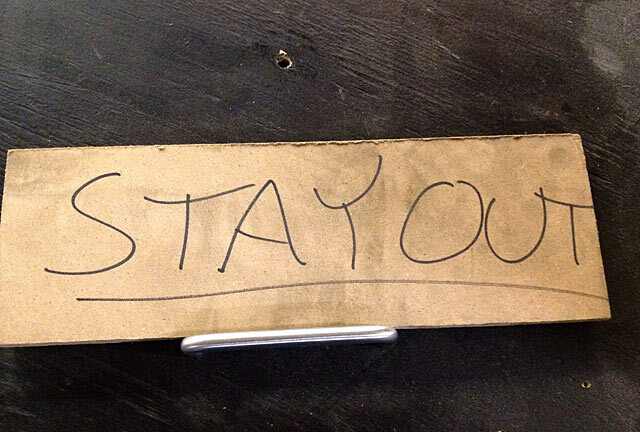 One of our members, who I’ll refer to as a “Master of Metal” made this fully-functional sign for one of our doors. Never again will someone attempt to enter said door without knowing who (and what) lies on the other side. 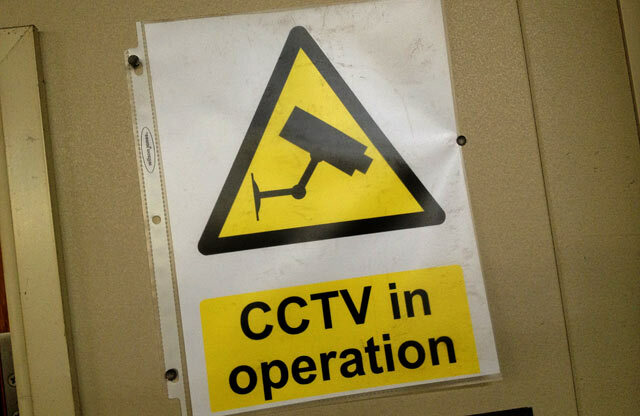 And when I say this sign is “fully-functional” I mean it is fully-functional. Enough said. 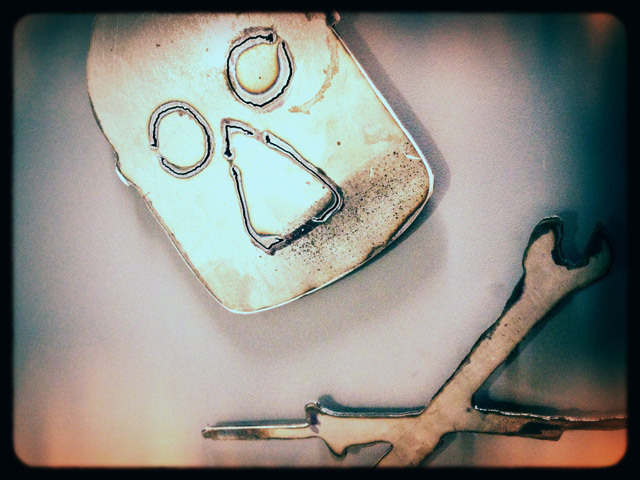 Lock-out tags are used by factory workers to clearly identify broken or damaged equipment. 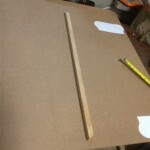 Milwaukee Makerspace is no exception. 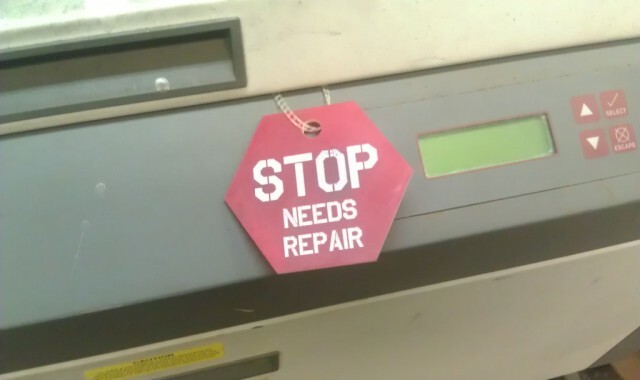 A set of stop sign-shaped, 3″ wide, 3/16″ thick, red plastic tags have been created with the words “STOP – NEEDS REPAIR” in bold, white letters. 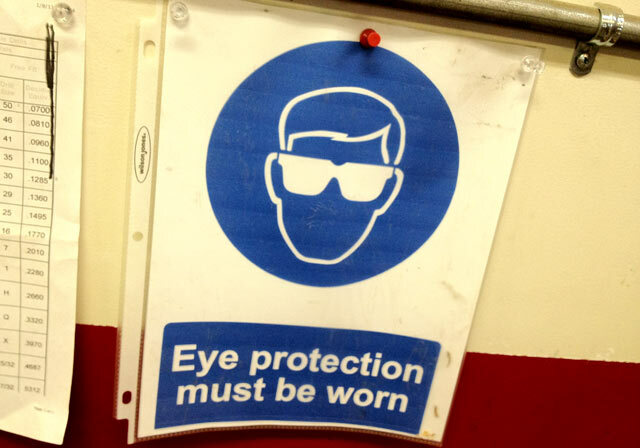 Tags are hanging over the first aid file cabinet by the light switches in the Workshop. If you find a machine is out of service, please zip-tie a tag to the machine, preferably over its ON/OFF switch so people can easily spot it and refrain from using a potentially unsafe tool. 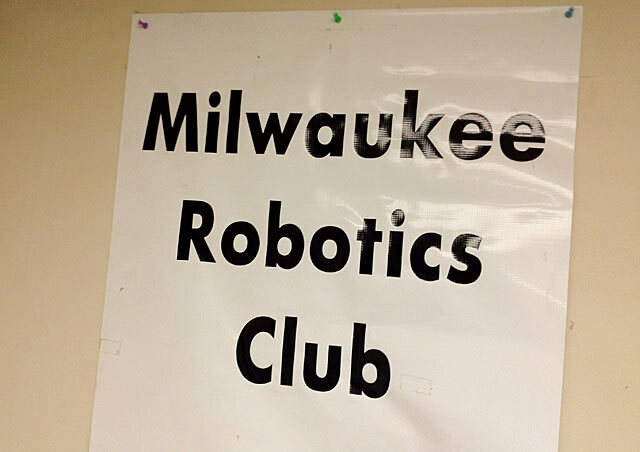 If you’ve only been a part of Milwaukee Makerspace through the web site, wiki, mailing list, or some other online thingamabob we have, and you’ve never actually been to the space, you’re missing out on something—the signs! 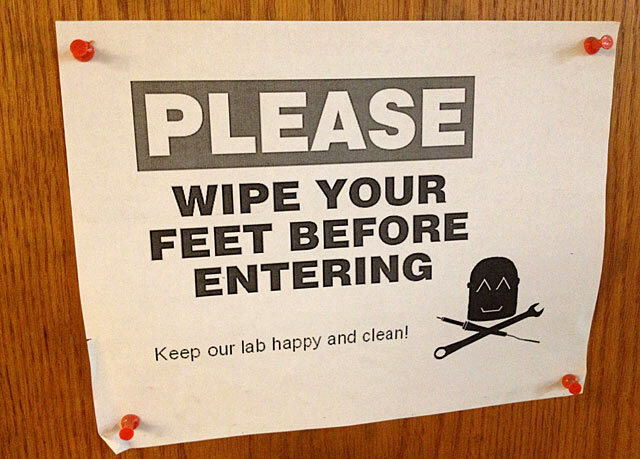 Besides all the purely informational signs, we’ve got some humorous signs, and a few signs that probably fit in both categories. 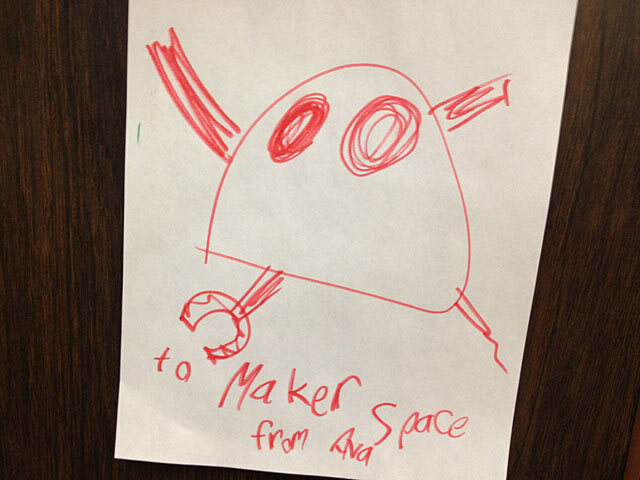 So here my friends, is a brief look at some of the signs of the Makerspace. 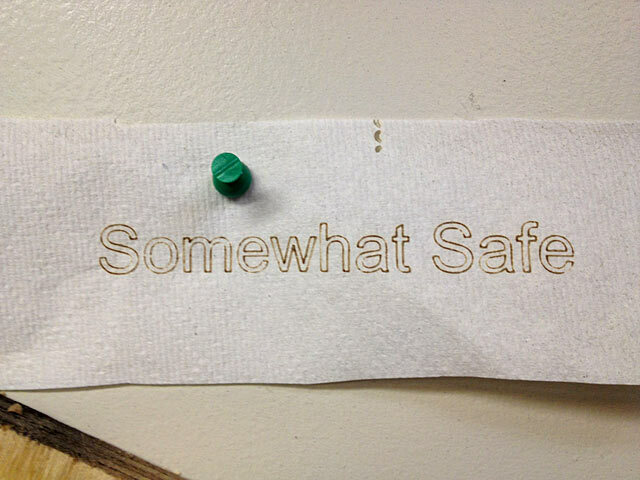 We have this special stuff at the space we call “Makerspace Filth” that, if unchecked, tries to infect everything. This is how we fight this menace. 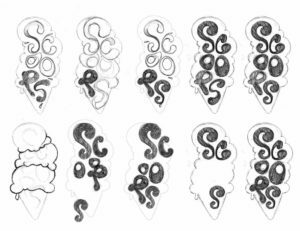 We have numerous classifications for our projects… From “Somewhat Safe” to… well, maybe I shouldn’t talk about the other end of the scale! 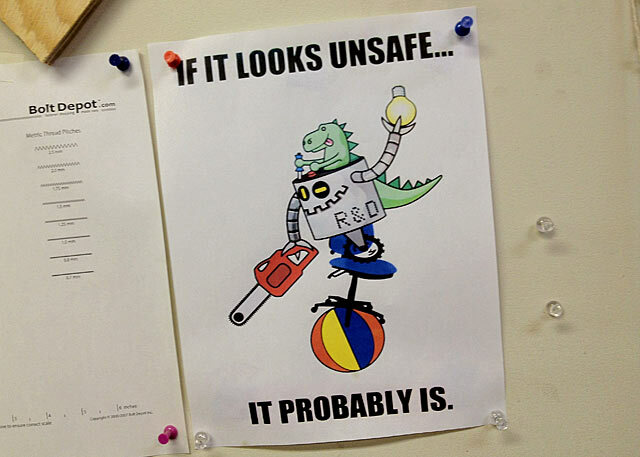 Speaing of safe, here’s a good reminder. I actually nicked this one from the guys at Robots and Dinosaurs. This makes sense right? 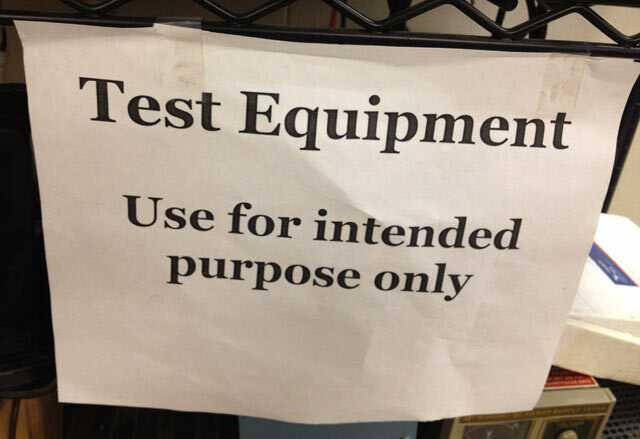 Things you should not use the Test Equipment for include: hammer, boat anchor, blunt object, doorstop, spider flattener. 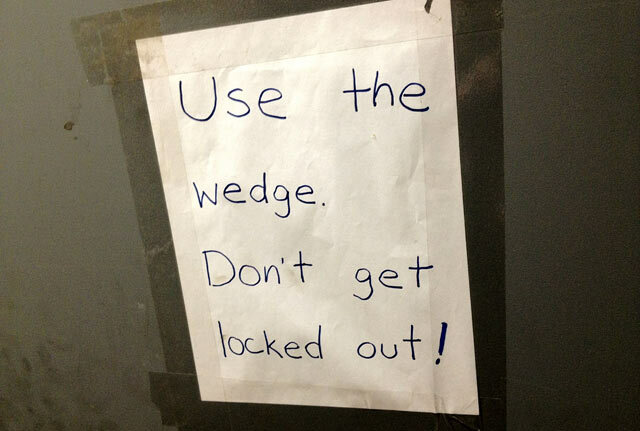 By the way… if you use the bathrooms, you might also want to use the wedge, so you don’t get locked out. 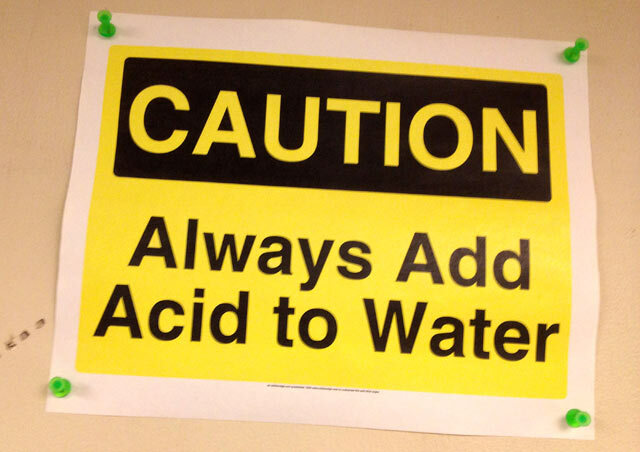 A gentle reminder to always add acid to water. 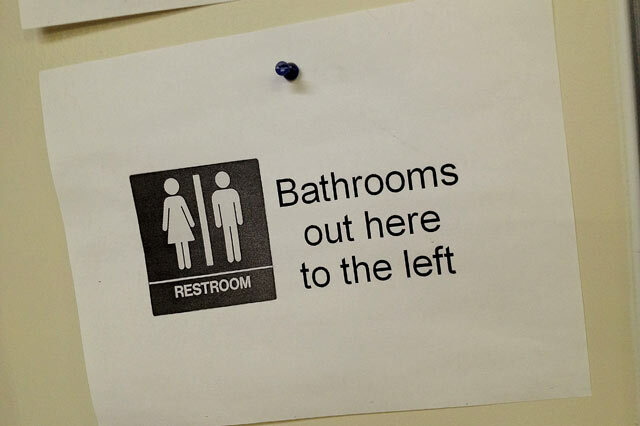 I’m going to assume the other way around is probably a bad idea. 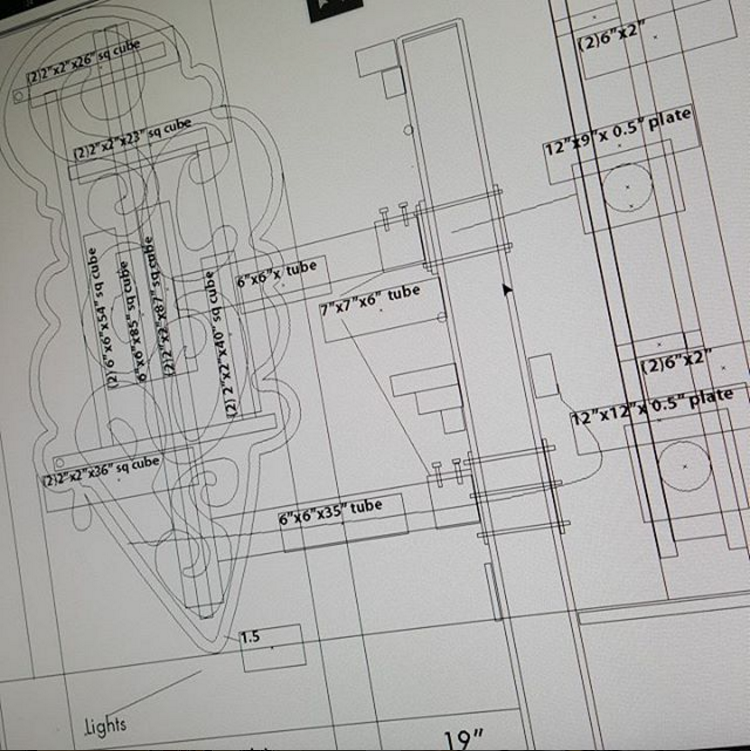 This one is on the laser cutter. 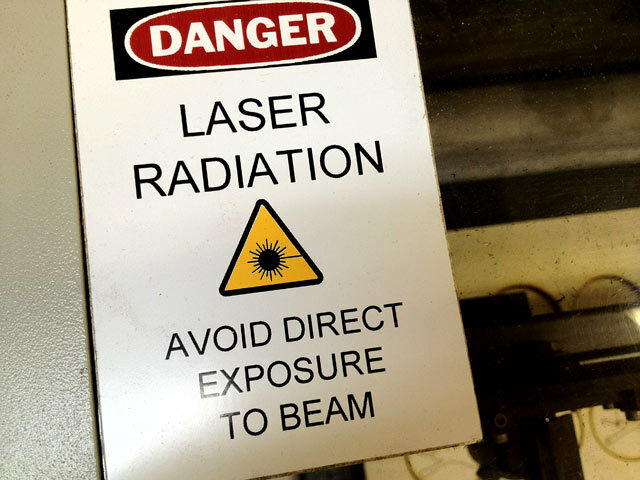 Yes, we have a laser cutter. And yes, you can etch a mirror in the laser cutter without destroying yourself or the laser cutter. 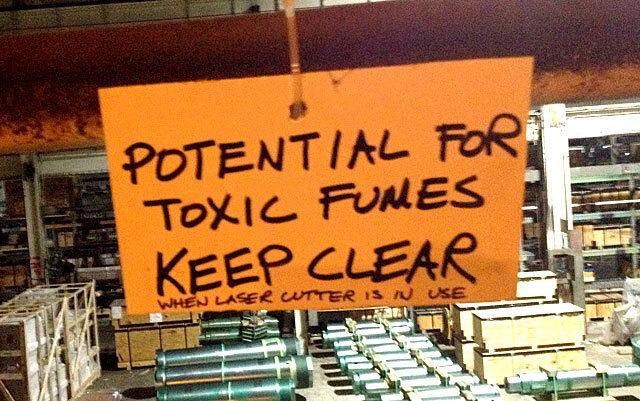 Speaking of the laser cutter, we do vent the fumes, but we figured it was still a good idea to put this one along the path of the vent pipe. 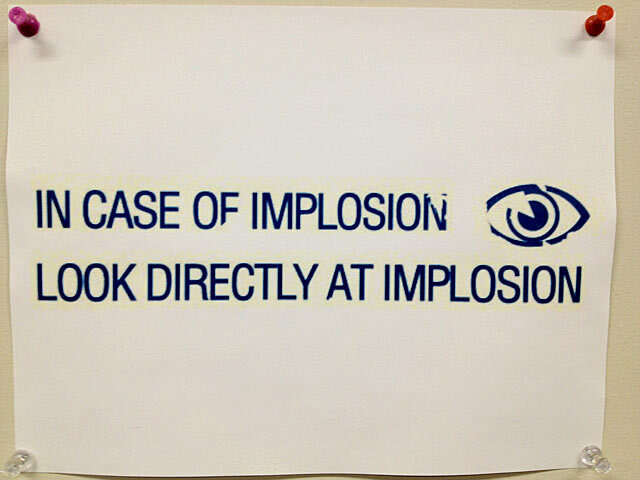 I’m not sure we’ve ever had an implosion at the space, but if we do, we know the proper procedure for such an event. 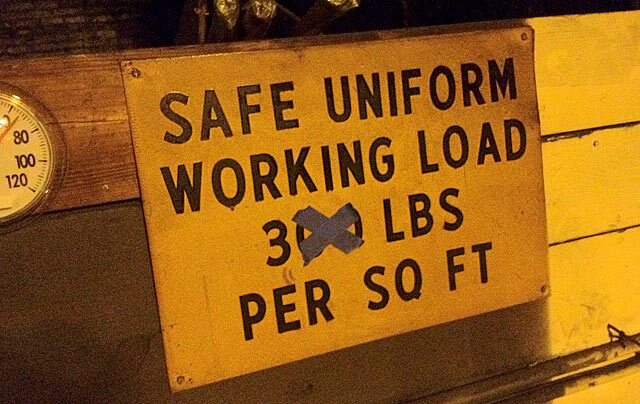 Hmmm, looks like the maximum load had dropped a bit since the initial construction of the building. Those old floors ain’t what they used to be! 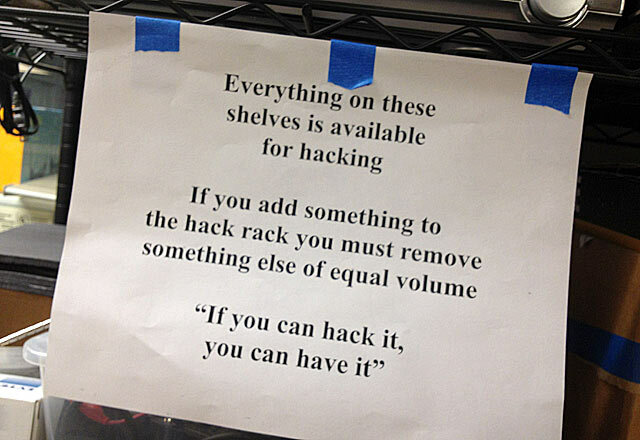 The Hack Rack sign has been upgraded since last year, and now includes the bit about taking something if you leave something—which is good—otherwise the Hack Rack would take over the entire space at some point. I’m not even sure this one is a sign… I think it’s actually artwork contributed by a member’s daughter. 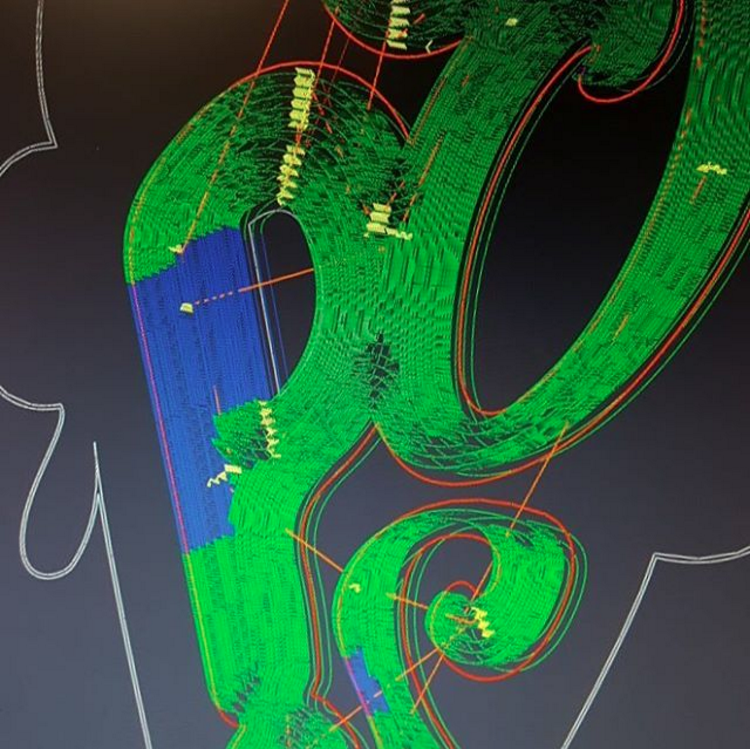 Either way, it’s a great interpretation of our logo. 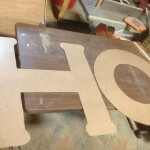 I hope you enjoyed the look at some of our signs! 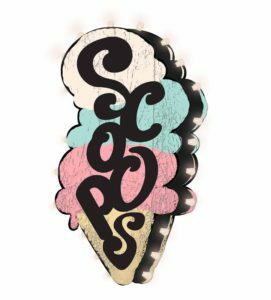 Let us know if you have any suggestions for future signs at the space!